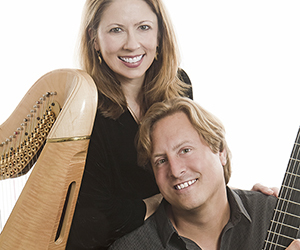 Tomorrow evening at 7:30 the Mesa Arts Center presents harpist Yolanda Kondonassis and guitarist Jason Vieaux. Along with a repertoire of solo pieces for those instruments both the harp and guitar are perfect accompanying instruments but when put together, especially with these renowned players, magic happens. K-Bach’s Sterling Beeaff sat down with the duo and found out how and when the collaboration began.